Greetings Brothers and Sisters….The Merriam-Webster Online Dictionary includes a section called the “Synonym Discussion”. transform, metamorphose, transmute, convert,transmogrify, transfigure mean to change a thing into a different thing. transform implies a major change in form, nature, or function. metamorphose suggests an abrupt or startling change induced by or as if by magic or a supernatural power. transmute implies transforming into a higher element or thing . convert implies a change fitting something for a new or different use or function. transmogrify suggests a strange or preposterous metamorphosis. transfigure implies a change that exalts or glorifies. That being said…Let me continue to the final part of My Story – The Transformation. So after coming home from North Carolina it was time to work on the marriage…continue to answer the difficult questions and try to explain my actions. Not a fun time, but like I said before, the fun was already had and it was time for work. I was so sorry for what I had done and I feel I was also mad at myself because of what I had done in North Carolina and that it made me have to come clean about my affair years earlier. I can say though it was a relief to not have to hold that secret anymore although it was like dropping a bomb on my wife. I was blessed to find a job when I came back although it was 100 miles from home. I gladly took it because although I had a 200 Mile commute each day, at least I was at home at night. So my days were long and many days I was tired. When I got home from work I had to do some “mental sparring” with my wife at night so I would be mentally exhausted. I would try to drink some nights but that never made for a good situation. I was also struggling to go to church when I came back…(You know my Mom would ask me each week if I was going!) The times I did go to church weren’t too bad but I was one of those people who was watching the clock to see when the Pastor was done and I never tried to socialize. Spiritually I new I was walking the fence and I had to figure out – was I going to church to please my parents again? or was I getting something out of it? One of my neighbors goes to my church and he knew I liked to make music and worked with the electronics, he asked if I could help out running the Audio Visual equipment at the church. I said yes. Little did I know that that was the start of my service in the church. Time was going by and everything seemed to be on a treadmill, moving but not moving. My wife was getting more frustrated with me because I wasn’t relating to her and my points weren’t getting though to her despite my efforts. I found I was really overwhelmed at this point in my life and through my job I decided to use the Employee Assistance Program and found a therapist I could talk to. During this time my father’s health started to deteriorate and he was admitted to the hospital. He was in the hospital for a week or so and through a lot of prayer he got better and was allowed to return home. So not only was this time stressful for me it was stressful for my wife – so much so that it put her in the hospital as well. So there I was going to two hospitals each night to see my wife and father, after driving a 100 miles to work each day, trying to take care of the kids. Going to therapy. Once again my life was a wreck. I started listening to Christian radio at this time and one day as I was driving down the highway headed to the hospital I heard a small voice in my head, Not the radio, not my thoughts, the voice said one word “Come!” I knew that was the Voice of the Lord speaking to me the Holy Spirit spoke to me!! I broke out in tears!! In that very moment my life changed forever! That Sabbath when I went to church I requested study for Baptism as I new it was time to stop walking the fence and give my life to God. The person who took my prayer request to the Pastor was my neighbor who asked me to do the Sound! He said he was going to take care of it personally. My Wife and I decided that it would be best to separate and not have me stay at our house so as to relieve the stress that was going on. It really bothered me to leave my home but God works in mysterious ways. I say that because during one of the worst parts of my life he allowed me to move in to my parents house as my wife and I separated. This was a blessing because little did I know that those months I spent at my parents house would be the last I would spend with my father. God was at work the whole way and little by little things have fallen in to place. 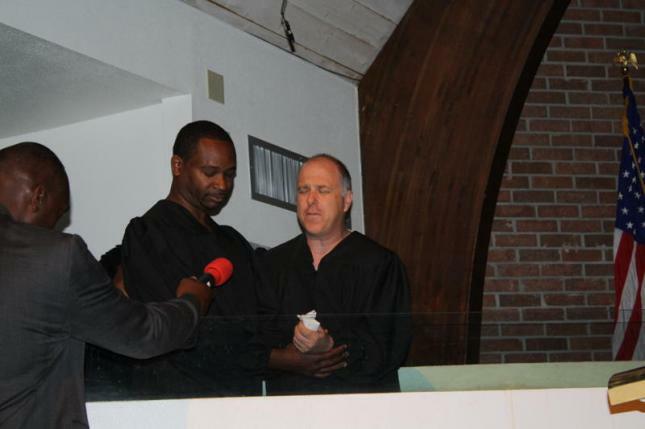 It has been almost a year since my son and I were baptized and we continue to attend church and do Sound. We feed the Homeless monthly, and I have been elected Men’s Ministry leader. I see God’s handy work in my life and I thank him for my journey, and my faith walk. I live for the Lord and I proclaim him to all I meet. I am doing my best to stay on fire for Jesus. This Blog is approaching 500 Views since I started it 6 weeks ago. It is already being viewed in the United States, Canada, Germany, Slovakia, The Netherlands, Portugal and South Africa. You see friends, God can use anyone he wants to to further his work. God is the Miracle worker able to Transform lives, hearts, and people. Without a great conscious effort the Lord Jesus Christ, has taken the desires of drugs, alcohol and other addictions out my life, he has changed my diet and I no longer desire unclean meats or shellfish, I remain a living testimony of His greatness and I can’t wait to see how he will use me in the next year of my life! Blessings to you all and thank you for reading my story and experiencing my journey. Until later, I am just….tryingtobeamanofgod.